Kruin Park is a very small nature reserve that is totally surrounded by the suburbs of Muckleneuk and Lukasrand and consists mainly of indigenous flora. Fauna is mainly limited to bird species and small mammals, reptiles and insects. 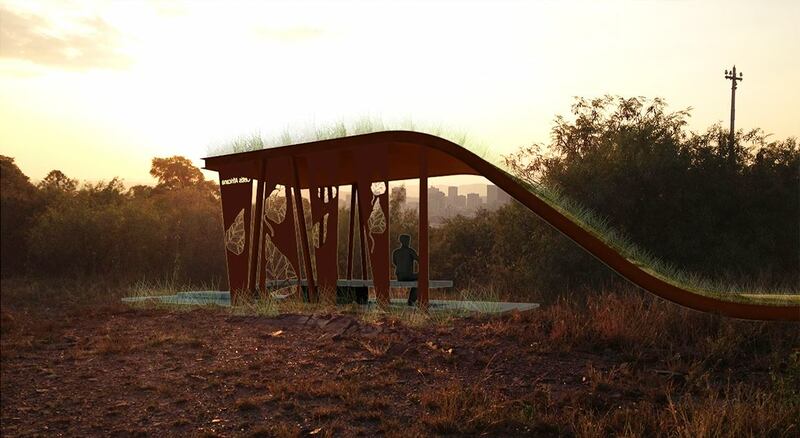 This purely conceptual project is an exercise to establish whether it is possible to provide a visually sensitive shelter inside this nature reserve. The objective is to create the illusion that a sheet of earth together with the vegetation is literally elevated off the ground from one side in order to leave a shelter underneath. It is made from corroded metal so it completely blends into the landscape. The pavilion is sited on an already disturbed area that has a magnificent view across the city.